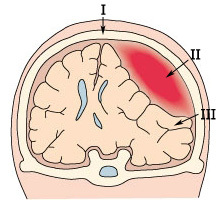 Subdural bleeding occurs between the hard meninges and the brain. the brain towards the opposite side of the skull. brain tissue can no longer function normally. Bleeding under the hard meninges, or membrane, subdural bleeding, is caused by a rupture of one of the blood vessels between the hard meninges and the brain. This condition is the result of a blow to the head. In young, healthy people this would have to be a strong blow to the head, but in the elderly, or people who for some time have had a high consumption of alcohol, also an insignificant blow might result in a subdural haemorrhage. The reason is a slight shrinkage of the brain resulting in expanded and fragile blood vessels. If you experience the mentioned symptoms you should seek medical attention immediately. It should be noted that some of the symptoms such as headache, Dizziness, etc are non-specific and seen in a variety of common and harmless conditions. If, as relatives, you note such symptoms in someone at risk (the elderly, alcoholics) action is needed to take the person to the doctor. It is important to mention to the doctor that there might have been a blow to the head.